Detailed review of Bio-Kult. See how this probiotic supplement compares against all the others! Overall, at 3.5 out of 5 stars, Bio-Kult is an above average probiotic. There are definitely a lot of qualities I like about this probiotic. The capsules are much smaller than average and easy to swallow. They also come in blister packs that make them convenient for every day use and for traveling. This probiotic is specially formulated to survive stomach acid and doesn’t need to be refrigerated. The directions say to take 1-2 capsules once or twice daily with food. It’s also flexible to meet a variety of needs. It suggests if you’re taking antibiotics to take at least 4 capsules daily, spread out throughout the day, and for at least 2 weeks after completion of the antibiotic course. It also says if you’re traveling, take 4 capsules daily and continue at least 1 week following the end of travel. This probiotic is also safe for kids and it says children under 12 should take half the adult dose. The capsules can be taken in the capsule form or opened up and sprinkled on food or mixed with water. This is a nice option for those who have trouble swallowing pills or for children. I really like that this probiotic doesn’t contain unnecessary additives and it’s non-GMO, gluten free, vegetarian, and free of artificial flavors, colors, and preservatives. At 2 billion cells per capsule, it’s on the gentler side of probiotics, however it does have quite a few strains (14). There are a few things that I don’t like with this probiotic. It contains MILK and SOY. They are in trace amounts and the company says it’s suitable for those with lactose intolerance but may be an issue for those with a milk allergy. Also, it can become hassle taking up to 4 capsules per day, especially spaced out and with food. I prefer the one and done method of taking capsules. As I mentioned earlier, there are 14 different probiotic strains in this product. That’s definitely overboard and I’m not a fan of these types of probiotics. When you have too many strains in a probiotic supplement, they can sometimes compete with each other. So more isn’t always better. 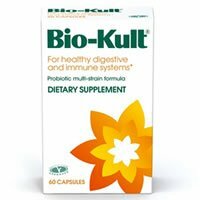 Overall, at 3.5 out of 5 stars, Bio-Kult is an above average probiotic because it’s specially formulated to survive stomach acid, doesn’t need to be refrigerated, and is versatile for different users, but it goes overboard with the strain amounts and requires up to 4 capsules per day. Bio-Kult contains 2 billion cells (per capsule) in 14 probiotic strains. If you’ve watched or read any of my reviews, you’re probably familiar with this strain. It’s definitely one of my favorites and has been used in countless research studies. Lactobacillus acidophilus has been shown to potentially relieve the symptoms from Irritable Bowel Syndrome (IBS), lactose intolerance, gut dysbiosis, and Crohn’s disease. Lactobacillus acidophilus may also help boost immune function, treat yeast infections, prevent traveler’s diarrhea, and decrease the frequency of urinary tract infections (UTIs). It also may be beneficial in balancing out the bacteria levels in the body, especially while taking an antibiotic. However, this strain has been researched to show potential benefits with reducing allergies, boosting immune function, and improving cholesterol levels. Bio-Kult has a few allergy concerns. The capsules contain MILK and SOY. This is a bummer since so many people suffer from these specific allergies. However, the company says that it only contains trace amounts of each. It also says that the traces of milk are at a level that would not affect lactose intolerance sufferers. The company does say that it may be an issue for those with milk allergies specifically. This probiotic is free of many other allergens, though. The capsules contain NO egg, fish, peanuts, shellfish, wheat, yeast, gluten, or corn. It’s also non-GMO, vegetarian, and free of artificial flavors, colors, or preservatives. The other ingredients include cellulose (bulking agent) and vegetable capsule (hydroxypropyl methylcellulose). For 60 capsules, lasting 1 month, it costs $20.30. When you break it down, it works out to $0.67 a day to take these. This is an average price for a probiotic supplement. I’d say it’s a good value for the price. I didn’t see any negative side effects when taking Bio-Kult. I was super happy about that. It does mention that some people may experience bloating or stomach pain for the first few days since it has a high amount of live bacteria. Unfortunately, I couldn’t find any sort of guarantee on Bio-Kult’s website. I would’ve really liked to see a money back or satisfaction guarantee. To buy Bio-Kult, click here.